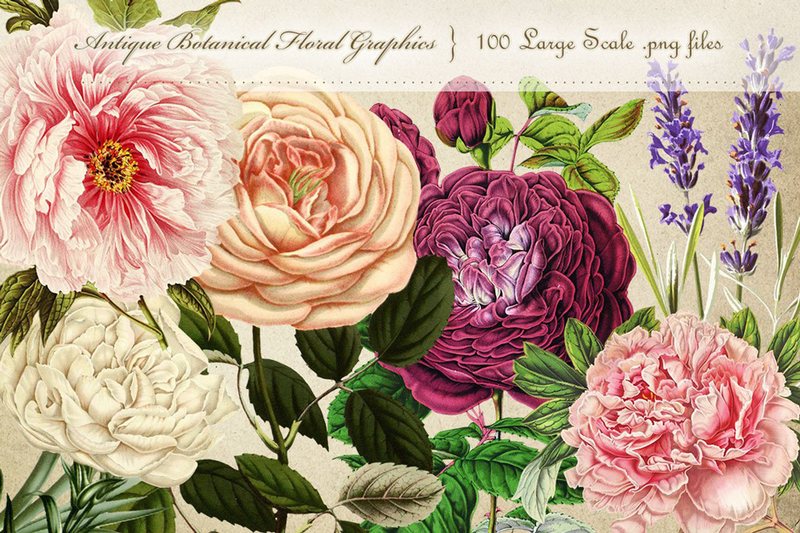 This is the ultimate collection of 100 antique botanical floral graphics. They have been carefully curated from a variety of antique sources, and each has been chosen for their beauty, color, size, and clarity. They are all large-scale files measuring 7″-12″ at their tallest or widest point. They are each individual .PNG files with a transparent background at 300 ppi. These can be used for so many different types of design work such as product packaging, t-shirt design, art prints and more. Types of flowers include rose, lavender, tulip, azalea, gardenia, poppy, clematis, camellia, waterlily, petunia, daisy, hydrangea, lily, snapdragon, peony, calla lily, and so many more! File size is approx 507.7MB (515.2MB unzipped), offered as a single download.